Corporate Watch recently wrote to B&Q concerning the supply of goods manufactured by companies that work out of illegal Israeli settlements in the Palestinian West Bank. The open letter to B&Q, reproduced below, asked for clarification of whether the store will cease its supply of Keter Plastics products. In January this year, activists held a protest against the sale of garden sheds made by Keter Plastics, an Israeli company that has a factory in the Barkan settlement industrial zone in the West Bank. 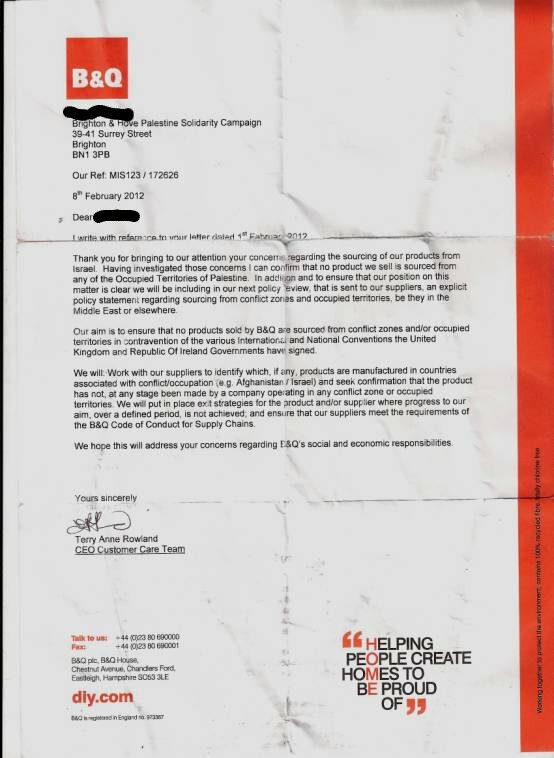 Since then B&Q has pledged, in correspondence with Palestine solidarity campaigners, not to sell products “sourced from conflict zones and/or occupied territories”. However, it remains unclear whether this means that B&Q will discontinue the sale of Keter products, some of which are manufactured outside Israel. Israeli settlements in the West Bank are established on land taken from Palestinian civilians by military force. The settlements are illegal under international law and their illegality is recognised by British Foreign Office policy, which states that the settlements are an “obstacle to peace”. Barkan, attached to the residential settlement of Ariel, was established in 1982 on the land of the Palestinian villages of Haris, Bruqin and Sarta. The industrial zone hosts a disproportionate number of factories that pollute the environment. 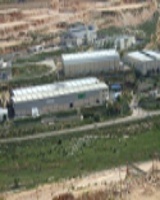 For example, waste from Barkan runs down the hillside of the Al-Matwi valley, damaging Palestinian farmland. Palestinian labourers are employed in the industrial zone and are paid, in several documented instances, below the minimum wage and denied the right to unionise. Corporate Watch welcomes the sentiments expressed in the letter but would like to clarify whether this statement means that B&Q will no longer deal with Keter Plastics.